" " He" (Guru Gobind) was succeeded by Banda, that butcher-like man .This infernal man having assembled multitudes of desperate fellows, all as enthusiasts, and all as thirsty of revenge as himself, commenced ravaging the country with such a barbarity as had never had an example in India.They spared no Mohammedan, whether man or woman or child. Pregnant women had their bellies ripped open, and their children dashed against their faces or against the walls." It is no wonder that the mild Bahadur Shah shuddered on hearing of such atrocious deeds." Banda Singh became master of the territory of the Punjab that lay to the east of Lahore. He marched upon Saharanpur (western U.P) with large army. A Pashtun zamindar by name of Jalal Khan Orakzai possessed certain villages in the pargana of Thana Bhawan in Saharanpur and had built a fortress and the town of Jalalabad there. His father , Hazar Mir Orakzai of Miranzai Khel, came to India during the reign of Emperor Shah Jahan. Jalal Khan put a stout resistance and foiled the attempts of the Sikhs to capture his town Jalalabad. "As soon as Sikh expedition eastward had crossed the Jamuna river , Ali Hamid Khan Qanauji, faujdar of that part of the country, took fright , and in spite of offers by the Afghan and other leading Muhammadans to repair the walls and stand on defensive , that very night marched away from Saharanpur , and took road to Delhi. 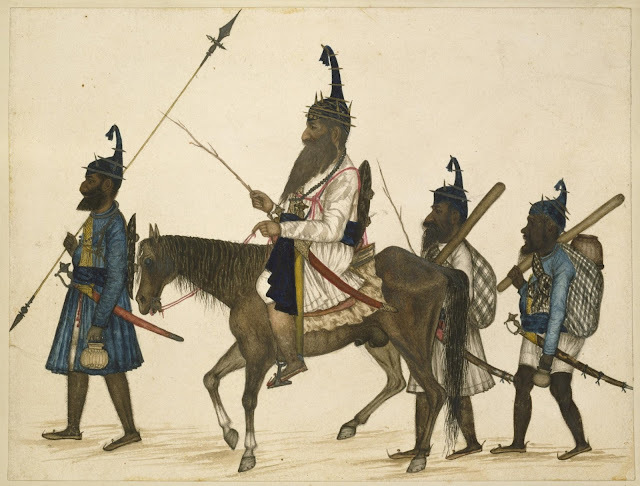 The Sikhs learning that the imperial officer had abandoned the town, made all haste to to the spot, soon overcame the resistance of the inhabitants , and plundered it as they had done Sarhind. The whole country , far and near, was in a panic. Those people who were rich enough or lucky to obtain means of conveyance , carried of their goods and families. The rest, taking their wives and children by the hand , fled on foot. Women who had rarely been outside the court of their own house , and had never gone one step out of it on foot , were forced to walk distances of thirty and forty miles. Many women threw themselves into wells to avoid outrage. In this way half of the sarkar of Saharanpur fell into the hands of the Sikhs. Next the Sikhs wrote to Jalal Khan Orakzai, calling upon him to submit. He lived at a town founded by him, and called Jalalabad ; lies about thirty miles south of Saharanpur and about twenty miles west of Deoband. The town is surrounded by wall , and many Afghan soldiers had homes there. When the Sikh messengers came before Jalal Khan Orakzai, he ordered them to be paraded derisively through the streets and ejected from the town. Immediate preparations were made for its defence. Soon word was brought that the Sikhs had surrounded two large villages , dependent on and situated four or five miles from Jalalabad. The Orakzai chief sent out a strong force to relive these villages , putting at its head Ghulam Muhammad Khan , his grandson , Hizbar Khan , his cousin. Encouraged by the arrival of the reinforcements, the villagers, four or five hundred men, armed with matchlocks or bows, and a number of their tenantry armed in various ways, many with only slings and stones , came out boldly to disperse the Sikhs. In the fight Hizbar Khan and a number of both Muhammadans and villagers lost their lives. But, in the end , pressed by repeated onslaughts from the Afghans, the Sikhs gave away. Mughal emperors had an elaborate system of the collection of news from all over the country through a network of news-writers. These akhbars were presented to the Emperor to obtain his orders thereon. The news-letters called the Akbar-i-Darbar-Maulla were not exclusively the news of imperial court as the title would suggest but were generally summaries of the news submitted to the Emperor. The following selected news-letters, translated by Dr.Bhagat Singh, deal with Jalal Khan Orakzai's battles with Sikhs.
" Parteet Rao, the harkara, brought it to the notice of the Emperor that in the suburbs of Sirhind and Lahore, a person has declared himself a Guru Gobin Singh [Banda Singh] and had collected a large number of men around him. He had also attacked Saharanpur. The Emperor ordered that the faujdars be urgently told to take action against him." " The Guru [Banda Singh] riding a horse , wearing a brocade dress and carrying in his hand a gun and a spear came out early in the morning. He was then encamped at Gulabnagar , also known as Buria, which was situated at four kos from Darbar. An elephant , two thousand and five hundred horsemen and ten-thousand foot-soldiers accompanied him. A news had reached Gulabnagar that the Sikhs had fled from Garhi Jalal Khan and reached Baghnagar also known as Saharanpur. The Afghans had dispossessed the Sikhs of their artillery and fourteen thousands rupees. The Guru [Banda Singh] told his followers that Jalal Khan would be captured in a few hours' time. " The Guru [Banda Singh] told Jan Muhammad , the zamindar of Gulabnagar that he had been appointed zamindar of the whole pargana. His lapses had been excused. He was told to go along with his contingent to bring Sardar Khan , the zamindar of chondla. He should then, accompany them to punish Jalal Khan, the Afghan. A news was received [by Banda Singh] that Jalal Khan had a large force at his command. The Guru [Banda Singh] told them that he [Jalal Khan] would be captured in a few hours time." A letter came from the home-place of Maruf Khan through the head waqia-nawais ...... on June 19, the army of the rebel Guru [Banda Singh] came out with imperial splendour upon the village Kehra where the Afghans of village Dehrana , etc. upto the village of Mukud had assembled for the purpose of fighting a jihad [against the Sikhs]. Jalal Khan accompanied by Ghulam Muhammad Banira, Pir Muhammad Khan and about two hundred horsemen came to Jalalabad and faced their adversaries on Wednesday. Some of the infidels were killed. They had created hell in the area of five or six kos. The Sikhs were defeated , took to their heels. ......."
Jalal Khan's letter addressed to Mauraf Khan was presented to the Emperor by Hidayat Kesh Khan. It was written therein that the rebel Guru [Banda Singh] had established his thanas at Rampura , Saharanpur, Buria, etc. With the help of the qananugos and rebellious Gujjars he [Banda Singh] had secured money...."
The master of the horse enquired from Wajih-ud-Din as to how distant was the home place of Jalal Khan Rohilla from Muzaffarnagar? He told that it was four kos. But the Guru [Banda Singh] intended to come to Saharanpur and the Sadat and other nobles were to assemble there...."
"Sayyid Wajih-ud-Din, son of late Lashkar Khan and master of the horse, came into the presence of the Emperor and expressed his regards. The Emperor enquired as to how distant was Jalalabad from Muzaffarnagar the home place of Jalal Khan Rohilla. He told that it was fourteen kos away. It was the intention of the rebel Guru to come to Saharanpur. Therefore, the Sadat and the nobles of Barah were to assemble there. " The people informed that thirty thousand horsemen and foot-soldiers of the Guru [Banda Singh] were present in the vicinity of Saharanpur. They had besieged Jalal Khan in the fortress...."
Prince Jahandar Shah Bahadur addressed a communication to the Emperor informing him that the rebel Guru had strayed away towards Saharanpur. Jalal Khan Rohilla's men and the Sadat were collectively six thousand horsemen in number. They fought the rebel leader [Banda Singh]. The rebel Guru had been annihilated. The Emperor thanked the God and ordered that the incident should be included in the official records. They enquired from Sayyid Wajih-ud-Din if he had also received that news. He told that he had received information of the fleeing of the rebels. On the previous night Wakalat Khan presented to the Emperor a sheet of paper sent by prince Jahandar Shah wherein it was reported that the fictitious Guru had reached Saharanpur. Jalal Khan Rohilla and Sayyid Taj-ud-din Khan, and the nobles and the zamindars of Barah in collaboration with one another went against the forces of rioting Guru. They got engaged in fighting and killed or wounded about eight hundred of them [Sikhs]. The others escaped and joined their unreal Guru. But the Emperor's men pursued the rioters into Saharanpur and attached their goods. That day, during the session of diwan-i-khas, Wakalat Khan presented to the Emperor an other report that the contingent of Jalal Khan had gone in pursuit of the Guru. The rebel Guru was reported to have been murdered and most of his followers wounded. Jalal Khan emerged victorious. The Emperor asked Syed Wajih-ud-din Khan if some news about the rebel Guru had also come from his native place. He reported to the Emperor that a letter about the fleeing of the Guru had reached him. Shikar Khan Karawal , master of the cavalry , made a request to the Emperor that the fictitious Guru had fought against Jalal Khan Rohilla. He escaped from Saharanpur alongwith fifty men. The contingent of Jalal Khan Rohilla was in hot pursuit of the rebel. He would be captured or killed. ....... Jalal Khan, Afghan, had a fortress near Saharanpur. He had removed two or three thanas of the Guru. He had created hurdles in the way of the Sikhs. It remained to be seen to how the case of the Afghans ended. .....He [Banda Singh] had dispatched his forces to drive out Jalal Khan . There was fighting between them. The son and relatives of Jalal Khan alongwith their men died fighting against the Sikhs. Jalal Khan, accompanied by few men was staying on in the fortress. Some persons had said that Jalal Khan had also been killed and some others informed about his running away. The real fact would be communicated after the necessary investigation. Shikar Khan Karawal received a letter dated July 21, 1710 from Qasba in the thana of Jalalabad. A part of the letter was read out to the Emperor and he was told that the forces of the rebel Nanak-worshipers had besieged the fortress of Jalalabad.....With the imperial grace , the Sikhs , after suffering a defeat, had gone away." "Tarafdar Khan , son of Jaib Khan was told that a contingent of seven hundred horseman and five hundred foot-soldiers be secured as a reinforcement for Jalal Khan who was fighting against the Nanak-worshipers...."
"Sadiq Khan was called from Mewat into the presence of Emperor and ordered that he, along with Usman Khan Karawal, etc. should join the contingent of Firoz Khan Mewati. The army of the above mentioned Khan was directed to go to Jalal Khan via Panipat".
" The Emperor was informed that Gobind [Banda Singh] with a horde of seven thousand horsemen and four thousand foor-soldiers marching from Dabar had reached Juhaal. The Sikhs intended to cross river Jamuna. Hearing the news Jalal Khan decided to block their passage on the ford of the said river and planned to punish them. " " A dispatch was received from the emissary appointed with Amir-ul-umara that Jalal Khan had crossed river Jamuna. He had three thousand men with him....."
"The Emperor learnt from the dispatch of the army of Firoz Khan Mewati that the said Khan had met Jalal Khan on the other side of Saharapur. He desired that both of them should jointly go to punish the rebel Guru [Banda Singh]......."
"It was brought to the Emperor's notice that the Nanak-worshipersand Jalal Khan Rohella got engaged in fighting. Three hundred of Jalal Khan's men and many of the rebels were also put to sword." "It was reported that Jalal Khan Rohella and others had been moving about to punish the Nanak-worshipers. On this the Emperor graciously inquired as to who were the persons who deserved to be rewarded. 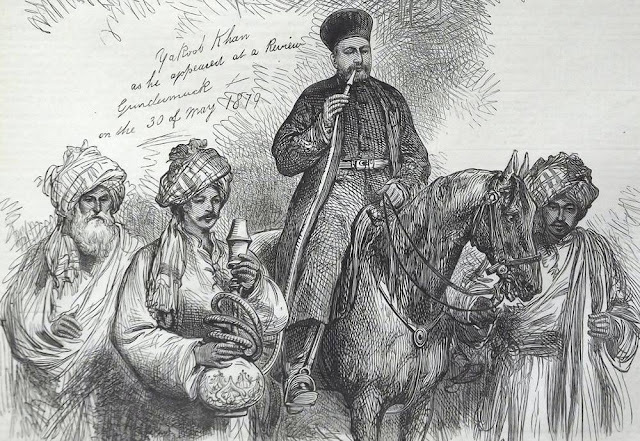 Jalal Khan was rewarded with the confinement of an elephant, a khillat, and a sword........"